Directions Shake well. Adults and children 2 years of age and older: apply to affected area not more than 3 to 4 times daily. Children under 2 years of age: ask a doctor. To apply to face, spray in palm of hand and gently apply. 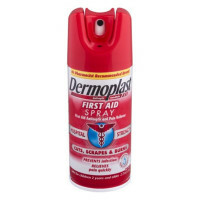 Uses Temporarily relieves pain and itching due to: sunburn, minor burns, minor cuts, scrapes, insect bites, minor skin irritations. 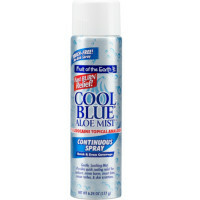 This gentle no-rub spray with lidocaine and aloe vera draws heat away from the skin to instantly cool and soothe sunburn while moisturizing to help reduce dryness. Continuous one touch spray for quick and easy application. Fragrance free, alcohol free, non-stinging and non-irritating. Leaves no sticky residue. Dermatologist tested. Warnings For external use only. Flammable: Do not use while smoking or near heat or flame. Do not use in large quantities, particularly over raw surfaces or blistered areas. When using this product: keep out of eyes; use only as directed. Intentional misuse by deliberately concentrating and inhaling the contents can be harmful or fatal. Do not puncture or incinerate. Contents under pressure. Do not store at temperatures above 120 degrees F. Stop use and ask a doctor if: condition gets worse; symptoms last more than 7 days; symptoms clear up and occur again in a few days. Keep out of reach of children. If swallowed, get medical help or contact a Poison Control Center right away.